(Newser) – Greenland isn't just losing Manhattan-sized chunks of ice from its huge glaciers. A heat-dome that moved over Greenland on July 8 caused surface melt to soar from 40% to an unprecedented 97% in just four days, reports Live Science. 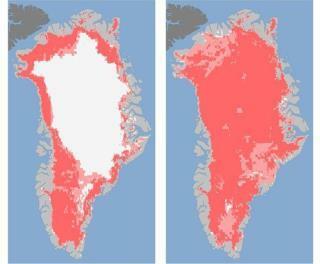 Typically, just half of Greenland's surface ice melts during the summer. "This was so extraordinary that at first I questioned the result: Was this real or was it due to a data error?" said one researcher. The LiveScience source article is a good read. Towards the end it basically says that even under what is now "normal" warming conditions Greenland will lose its ice sheet in about 2000 years and the world sea level will rise by about 23 feet in that amount of time. That's what they think the "normal" trend is now. LOL If this current warming were to persist year after year it would just happen a whole lot quicker than that.